Today I want to share some more of my Satin Stitch explorations with you. This time I looked at different Satin Stitch variations I found in the embroidery handbooks I own. I'm sure many of these stitches kind be found in various books though! 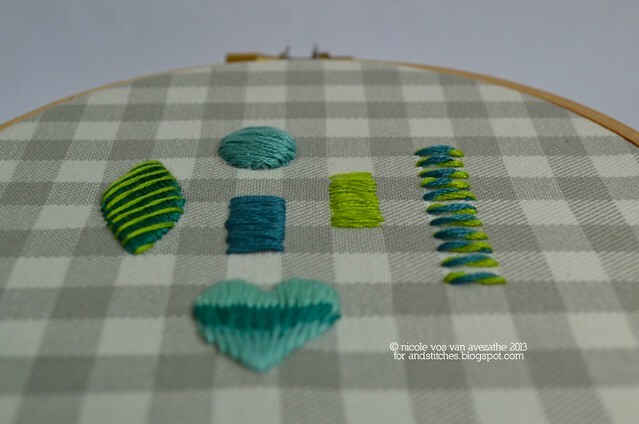 The teal coloured rectangle (well an attempt to a rectangle) is the regular Satin Stitch. The green rectangle next to it, is the Surface Satin Stitch. I learned this stitch from Mary Thomas's classic Dictionary of Embroidery Stitches. Normally you would start (for example) on the left side of your rectangle, make the first stitch to the right side of the rectangle, insert the needle into the fabric and let the thread travel on the backside all the way back to the left side. With the Surface Satin Stitch you start at the left, make your first stitch to the right. Pick up a few (tiny) threads of the fabric with your needle and go straight back with a second stitch from the right to the left. As result your backside doesn't show any thread and it's more economical too! I need more practice but I think, especially for embroidery work where the backside is on show (a tea towel for example) this is an interesting option. Moving on to the Twisted Satin Stitch on the far right of the photo which I found in one of my favourite handbooks: Jacqueline Enthoven's The Stitches of Creative Embroidery. I used a contrasting colour to show how it's made. It's a variety that gives some texture to the stitch. The round shape was based on what was described in the handbook I used, A-Z of Embroidery Stitches, as a Satin Stitch Padded Berry. On the first photo you can see it really did get to some height after a few layers of Satin stitches, alternating horizontally stitched satin 'blocks' covered by vertical satin stitches etc. For the leaf shape on the left I tried the Wrapped Satin Stitch, also from Mary Thomas's Dictionary of Embroidery Stitches. The leaf was outlined with a split stitch, diagonally filled with a Satin Stitch and then 'wrapped' with a contrasting thread. Looks a bit like a Christmas ornament to me! I used the Encroaching Satin Stitch, again from Mary Thomas's book for the heart shape at the bottom. The idea is that the 'head' of the stitch is 'planted' between two stitches in the row above. Which is kind of difficult if you have placed your satin stitches really close to each other. According to the book it's useful for shading too. Now there are many more Satin Stitch variations not high lighted here, for even-weave fabrics especially. I found a lot of interesting ones in The Complete Stitch Encyclopedia by Jan Eaton for example. 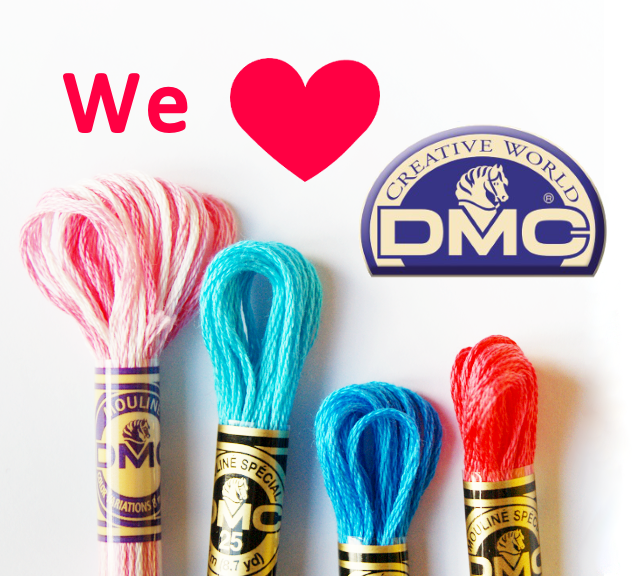 Hope you are enjoying our Satin Stitch 'month' so far. If you have suggestions for other versatile Stitches we need to explore please let us know! 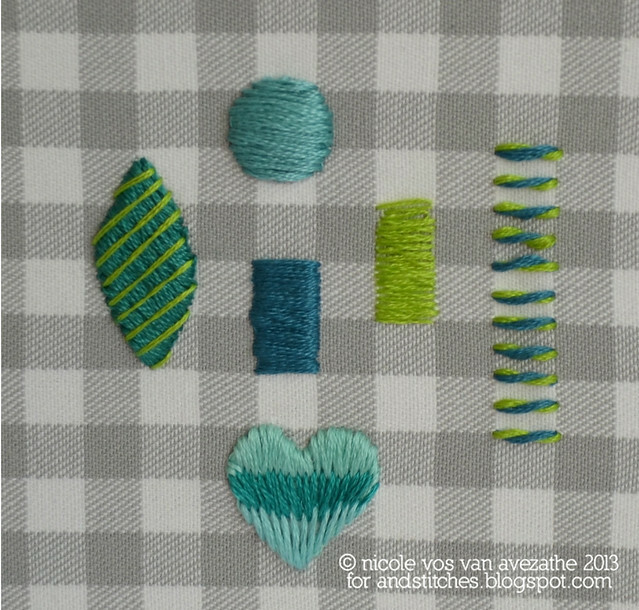 Another great stitch tutorial from &Stitches to add to my embroidery book marks! Thank you! Especially like that pretty leaf!